The best resource I’ve found on how (and why) to play Rally Scoring is Jay Kennedy’s excellent article on his club’s website, Pickleball OSC. The following is a modified version of Jay’s original, and published with his permission. Rally Scoring Rules for Doubles Pickleball can be found further down this page. A number of years have passed since historically older sports like badminton, squash, table tennis and volleyball replaced their outmoded scoring systems with the rally point system (also known as “point-a-rally” or “PAR”). Within short order, players in those sports adapted to these simple changes and carried on competing in their games as they always had. Today, the vast majority of athletes in badminton, squash, table tennis and volleyball are happy to report the numerous benefits that rally point scoring has brought to their sports. The same, however, cannot be said for the sport of pickleball. In an effort to address resistance to rally point scoring in this sport, a group of experienced racquet and paddle players from Okotoks and Calgary set out in January 2017 to organize Pickleball OSC. During its development, organizers of Pickleball OSC sought out competitive and forward-thinking athletes who were willing to score games using the rally point system. Players attending the first Pickleball OSC event came from an assortment of other clubs but despite their traditional scoring backgrounds these open-minded individuals easily transitioned to rally point scoring and never looked back. Games scored using the rally point system conclude sooner than games scored using the traditional scoring method – an outcome common to all sports that have made this change. Because rally point games finish sooner, court rotation improves while sideline waiting is noticeably decreased. Rally point scoring permits Pickleball OSC to accommodate a larger pool of talented players than what would be possible on the same number of courts using the traditional scoring format. The use of rally point scoring has not changed the fundamental nature of pickleball. Like all other sports that have adopted this system, shot selection and game strategies remain largely unchanged. The rally point system simplifies scoring by eliminating the second-server. Are Pickleball Players Resistant to Rally Point Scoring or Are They Just Not Familiar With It? Perhaps the failure of organizers to adopt rally point scoring in pickleball can be explained by a lack of understanding and awareness. In other words, it is possible that the racquet and paddle backgrounds of those organizing and playing the sport are limited to pickleball. Although such a scenario is doubtful, it would mean that pickleball players do not typically migrate to their sport from other racquet and paddle sports. If that is the case, the failure to examine an outmoded scoring system could be explained like this: pickleball organizers simply do not have broad enough racquet and paddle backgrounds to appreciate the benefits that rally point scoring brings to other games. As such, an effort to familiarize organizers with the rally point format is all that would be needed to make way for scoring improvements to this game. On the other hand, the converse may well be true: the majority of pickleball players and organizers do have broad racquet and paddle backgrounds and, consequently, this group of people is well aware of the positive attributes of the rally point scoring system. If this scenario is correct, the continued resistance to the adoption of this scoring system is, at the very least, puzzling. Did you actually say, “Zero, Zero, Two”? The phrase zero-zero-two signifies the beginning of a pickleball doubles game that is being scored in the traditional manner. The third number in this three-number sequence indicates which person on the team is serving (first-server or second-server) and whether or not that team is permitted to continue serving once it makes a fault. This three-number scoring system (known as “hand-out” or “side-out” scoring) is used persistently in the sport of pickleball and is inherently confusing and sometimes difficult for beginning players to learn. Even popular pickleball websites readily acknowledge that three-number scores are troublesome and regularly offer advice on how to cope with these complications. For example, one such site recommends that the first-server “…wear a colorful wristband” to help keep scoring matters straight. It is amusing to note that advice designed to reduce scoring confusion is itself often confusing (see article here). Furthermore, because pickleball players also insist on reporting scores as three numbers (ie. zero-four-two) rather than as as two numbers followed by a server-phrase like other sports used to do (ie. zero-four; second-server), the interpretation of pickleball scores is particularly prone to misinterpretation. Specifically, scoring confusion may be created by three-number scores if the server either accidentally or purposefully calls part of the score indistinctly. Mumbling: What Did That Player Say? To illustrate this point, consider a doubles pickleball game situation where the score is “two points” to “three points” and the second-server is serving. In this case, pickleball players will report this score as “two-three-two” rather than the identical but much clearer scenario of “two-three; second-server”. In fact, pickleball players have been known to boast that the three-number-scores that are peculiar to their sport happen to distinguish it from all other racquet and paddle sports. What is largely unrecognized by these players, however, is that three-number-scores provide an opportunity for confusion not found in scoring systems of other sports. Specifically, when reporting the score in this manner (where the server calls “two-three-two”, for example), if the server mumbles over the first number (two) but enunciates the other two numbers properly (three, two), the opposition may well hear “three-two”. If that is the case, the receiving team may then mistakenly surmise that the score is three-points to two-points (rather than what is correct: two-points to three-points). Furthermore, because the receiving team may be conciliatory, players on the receiving team might choose to carry on with that rally assuming that the server simply neglected to call the server-number (which is, of course, not the case in this example: the server actually called the score by inaudibly mumbling “two” then clearly calling “three” followed by clearly calling the server number “two”). Although not widely acknowledged, attentive pickleball players do understand that this sport’s insistence on calling three-number scores rather than two-number scores followed by the server-phrase can and does result in scoring confusion. Forget All That – Let’s Play Rally Point! Games scored using the rally point system feature simpler two-number-scores. The first and second server-numbers particular to traditional pickleball scoring (where players can be heard saying, “one” for first-server and “two” for second-server) are never heard in a rally point game because rally point games do not have second-servers. Consequently, people choosing to score pickleball games using the rally point system will never be found wearing colourful wristbands unless, of course, they are using those wristbands to fashionably control sweat. A misconception common to pickleball players who may be considering the transition from traditional scoring to rally point scoring is that somehow rally point scoring offers only one player on a team the opportunity to serve for the duration of a particular game. This of course couldn’t be further from the truth: in games scored by the rally point system, both teammates end up alternating serving responsibilities at certain times throughout the game. For more on this, rally point scoring rules and a rally point scoring diagram have been provided further down this page. Just because we’re doing pickleball differently doesn’t mean that we think the game is seriously flawed. If that were the case, we wouldn’t be playing it. Instead, experiences in other racquet games led the organizers at Pickleball OSC to adopt rally point scoring because the system offers readily measurable positive outcomes to the game, the club, and the club members. The same cannot be said for traditional scoring practices. On another note, it is important to mention that members of the Okotoks South-Calgary Pickleball Club play the “traditional game” at venues that do not recognize or have not yet adopted the rally point scoring system. Transitioning between rally point and traditional scoring formats is not difficult. In fact, Pickleball OSC players have been known to do this on a day-to-day basis depending on which club they choose to visit. 1. Each side has only ONE service although both players on a team will alternate serve at points throughout the game. 2. The service passes consecutively to the players as shown in the diagram below. 3. At the beginning of the game and when the score is even, the server serves from the right court. When it is odd, the server serves from the left court. 4. If the serving side wins a rally, the serving side scores a point and the same server serves again from the alternate service court. 5. If the receiving side wins a rally, the receiving side scores a point, but receiving players do not switch sides (see next point for clarification). 6. The receiving side becomes the new serving side. 7. Players do not change their respective service courts until they win a point when their side is serving. 8. 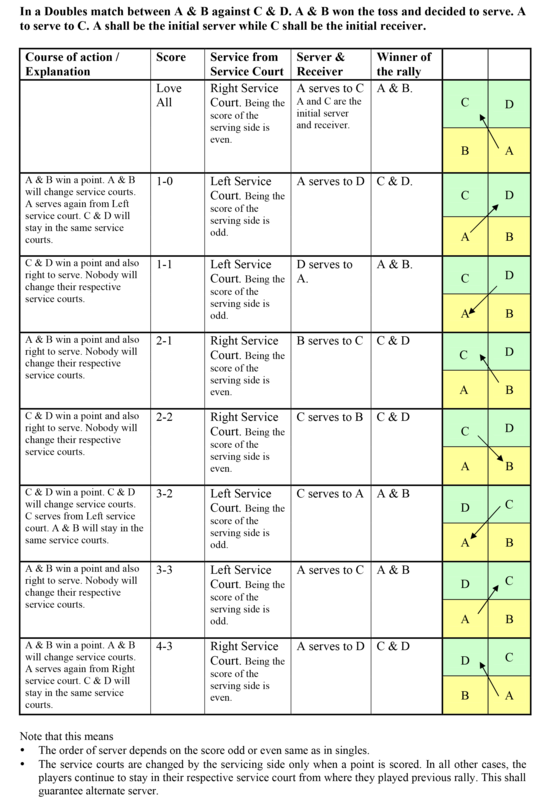 The service court is changed by the serving side (never the receiving side) and only when a point is scored. In all other cases, the players continue to stay in their respective service court from where they played the previous rally. This guarantees an alternate server. 9. The order of server depends on whether the score is odd or even. 10. Games are played to 15 points (win-by-two). If the game is not won (by two points) by the time the score reaches 20-20, the first team to reach 21 points wins (win-by-one). An example game follows (see the chart below): Players A & B are in a match against players C & D. Team A & B won the toss and decided to serve. Player A serves to player C. A is the initial server while C is initial receiver. All rally scoring — all day long! Every day is Rally-ween at our club. We only play rally point. Four days a week at 10 am. in a 1, 2, 3 waiting order sequence. We’ve been doing it for over a year. Because it is on Halloween, we could also call it “Pickleboo Rally-Ween” in honour of Halloween and Pickleball. I play rally point in both Pickleball OSC and BRPG and have also played traditional scoring at other clubs. I whole heartedly agree that rally point is the way to go and will eventually become the norm in pickleball as it has in other sports as outlined in Jay’s article. For those of you who are concerned that it is confusing or difficult to learn, rest assured that if you try it in practice it will take you far less time to master than it does to read the explanation above! It’s easy and fun. Try it! Pickleballs 2 bounce rule was implemented because only the serving team can score. Since rally scoring takes away that advantage should the 2 bounce rule be eliminated. After all that is the next rule that many new players forget about. Serve me the Rally Point System !! !…….I’m ready to play with it…..If most of the players begin using this system the rules will have to change….. Although some aspects of rally scoring seem easier, I am wondering about how you would keep track of the correct serving and receiving positions? Sure it is easy if players stay on “their side of the court”, but in some playing situations the players must switch. I also wonder about “stacking” with this scoring system. I like the idea of rally scoring as well but I also wonder about stacking. Has anyone figured out how to stack with rally scoring? Has the idea of the serving team players not switching sides after scoring a point been considered? Is there a downside to each player simply staying on the same side (even or odd) the entire game? For example, if the even player serves and their team wins the rally, the odd player on the same team serves the next point. Just wondering if I’m missing something. What issues would prohibit switching servers back and forth within a side out. Players on the same team would serve basically the same number of times each game. It would be simple for everyone to remember which side of the court they are supposed to be on or who is serving. This would be much easier for new players. To ensure your skills are honed from both the odd and even court, a player can switch sides every game if they want or play the same side most or all of the time if they desire; for example a left hander playing the even court. Interested in hearing your thoughts on this… thank you. Nicholas: I’m wondering the same thing. When I play we are always switching sides, etc. There is no longer an even and odd player to help you get on the correct side of the court. How would we determine where to go? I am an advocate of rally scoring so I asked my friends to give it a try. No one else liked it. The biggest complaint was not knowing what side to be on after scrambling during a long rally. They’re used to the odd/even score telling them where to be. They also complained that it was harder to make a comeback as the side-outs added points. I think playing to 21 might be better than 15, which goes a bit fast. I’m an old volleyball player and I remember making the transition to rally scoring many years ago. People complained at first, but after a couple of months it seemed perfectly normal. For volleyball, it was a top-down decision as the Olympics made the change first, then the beach pros and NCAA followed. Eventually, the high schools and recreational players adopted rally scoring just to be consistent with the higher levels. One thing that might help people remember their sides in rally scoring is that the rotation of servers is fixed by the positions at the start of the game. In the diagram, the teams are A and B vs C and D. The first server is A and the first receiver is C, on their respective right sides. The service order cycles through A, D, B, and C for the rest of the game. Note, the first receiver is the last server. So you always know the order if you remember how you started. When your side is serving, it’s easy to remember even score = right side, odd = left. The receiving team never switches sides so if you can remember where you were for the previous rally, go there again. If you need confirmation, think about who is serving and who was the previous server. If you were the previous server, you are the “even” player — on the right if your score is even, on the left if your score is odd. Going to be harder for refs to keep track the servers. We tried the rally scoring in two ways. One: was to still have both players (except the first) serve before a side out is called. That is A serves until a miss and that point goes to the opponent, but the second server then serves until they are beaten. This insures that the players get an equal chance at serving. Two: we tried with the one person serving per side as described above. In the example above “A” severed most of the game and “B” served only once. We found the same thing. Conclusion: We think the Rally Scoring is good for court turn over when more players are present than we have court for them to play on. Rally would be good for tournaments, because the down time in a game (rally when no point is earned) would be a non-factor. The group does not like the one server per side per turn. Just our thoughts from KC, MO. 1. Players choose a side (even or odd) and stay there for the duration of each game. 2. The server changes within a side out depending on the score. For example, if the even player serves and their team wins the rally, the odd player on the same team serves the next point. This simplifies the rules and would minimize some of the issues being raised. 1. Players on the same team would serve an equal amount (or very close to the same amount) each game. Receiving equal as well. 2. Stacking is easy since you choose a side for the entire game. Less running around as currently being done. 3. Should be real simple for team members or officials to determine who is serving (depends on odd or even score). 4. Would be much simpler for beginners and spectators to learn the game. Very interested in hearing thoughts on whether or not this can work… thank you. As a prelude to Rally Ween I introduced rally scoring to a group of eight players and found (much to my surprise) that they enjoyed it. In fact, they insisted that we continue it throughout our two-hour play period. The only problem I see with rally scoring is that is is soooo hard to go back to the incredibly slow-slow pace of side-out scoring. On Halloween my club had a costume party and used rally scoring. Everyone enjoyed it once they played a couple of games and learned how to score. I can’t wait until it gets adopted worldwide! Our club haven’t found a problem with inequity in serving. No one I’ve ever played has complained they didn’t serve enough when we used rally scoring or that they felt serving was lopsided, so I don’t see this as a problem in need of a solution. Rally scoring could be tested empirically (if it hasn’t been already) by charting the serving opportunities of partners using rally scoring over a few hundred games. My sense is that while it is easy to come up with scenarios that would suggest server inequity in any one game, over the long haul, I bet serving opportunities balance out in the long run. Of course, even in side-out scoring one partner can run the table with their serve, leaving their partner with no serves or one partner could serve a majority of the points leaving their partner only a few. Sometimes that happens and it will happen with rally scoring too. Nevertheless, your idea is intriguing. It could work if people would accept it, but it is going to be hard enough to get people to accept the idea that every rally ends in a point much less accept that they must also restrict themselves to one side of the court. (The vast majority of players do not stack.) People can accommodate only so much change at a time. In rally point scoring, the serve, by design, always alternates between partners each time they win the serve back from the other team. By this I mean that if I am serving and we lose the rally the serve goes to the other team. When we win the serve back (by winning a rally) my partner will always be the one serving. This is accomplished due to the serve always being on the right if your score is even and left if the score is odd. When you lose the serve, if your score was even, the player on the right was serving. In order to serve again you must win a rally. In winning a rally you gain another point which makes the score odd. The receiving team does NOT switch sides when they win a rally, therefor the player on the left now would be serving. I like to assist new players learning the game, and without a doubt one of the biggest challenges is getting them to understand and become comfortable with the silly scoring system in current use. The reality is, that even for experienced players, when we all begin to get physically and mentally tired, keeping track of the score becomes more and more of a challenge for all of us. I think the potential for a change in our scoring system is exciting, practical and the right move for our great sport. I pay a quick visit daily a few blogs and information sites to read articles, but this weblog gives quality based content. This is well explained/ illustrated. It’s upto you to read and understand how rally scoring works. After reading it apply it when playing. Start out with a small group who is willing to keep an open mind and want to try it out for size. Not someone who is half hearted and simply patronizing you. I’ve always said that the one reason for constant confusion in PB doubles scoring, is the way they use three numbers. Kind of a lottery numbers game, lol! Makes little sense when you can say first server, second server, point, side out etc. In addition to it there are players who don’t say the score loud and clear. On top of that they begin telling you you didn’t say it loud enough, lol! Go figure, now they’re admitting they’re hard of hearing, Hahahaha! Not your fault as much as it’s not theirs either perhaps. The other scenario is, when the server mumbles the first or second number while still saying the other ones louder and clearer. Gosh! When are people going to get the complete picture? Surely not while using an antiquated scoring system that’s crying out to be replaced by a proven rally scoring system that works flawlessly if given a chance. One thing is for sure also. It’s not in any way for the stubborn and unwilling minded set. So many flaws and still only a few recognize it in order to fix it. Like a festering wound, it will only get worse if not treated. Thanks for this article. Hopefully Picklers ar listening and wills trive for changing for the better. Complacency isn’t going to do it folks. Look and think outside the box. If that works for you, lol!